“Banking stocks have been in positive momentum and instrumental in pushing the Abu Dhabi index to a new level. The banking names are expected to do good,” said an analyst who did not wished to be named. Abu Dhabi Islamic Bank shares witnessed a low of Dh4.29 after it went ex-dividend on March 21, and the shares have recovered, meaning traders received capital appreciation along with dividends. ADIB shares have recovered 15 per cent from its ex-dividend level. There is a perennial demand for dividend yielding stocks in the UAE market, which is dominated by retail investors. ADIB has been best dividend accruing stock. The stock has given a dividend yield of 6.27 per cent in the past five years, followed by National Bank of Ras Al Khaimah, whose dividend yield was at 6.7 per cent since 2013. First Abu Dhabi Bank witnessed a low or Dh13.50 after going ex-dividend, but witnessed sharp recovery of 10 per cent to Dh15.28. 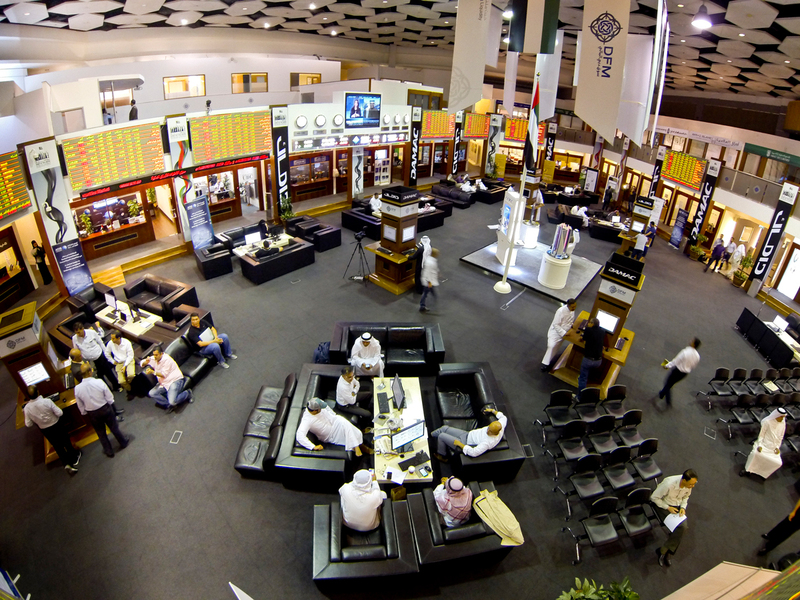 “There is a perennial demand for dividend yielding stocks in the UAE market which is dominated by retail investors. Dividend payouts by companies are typically considered to be a healthy sign. In the recent earnings season most of the company management have indicated higher dividend payouts to reward the investors, we see this trend to continue,” MR Raghu, Managing Director at Kuwait-based Marmore Mena Intelligence, told Gulf News. In UAE, the total dividends paid in 2018 has increased by 16.2 per cent year on year to be $10.1 billion as compared to 2017, out of which about 51 per cent is contributed by the banking sector (up by 13.4 per cent YoY), which is usually a major contributor. “As the overall economy looks to recover in a reasonably stable oil price and interest rate environment, banking industry is expected to perform well. Hence negating any reasons for a potential shift from these high dividend paying counters,” Raghu said. However, traders have been brtual with real estate stocks. Aldar Properties shares are still languishing at Dh1.70 after it went ex-dividend levels on March 28. Normally, market decides on the fate of the stock after the ex-dividend date, whether they would want to buy, or sell. 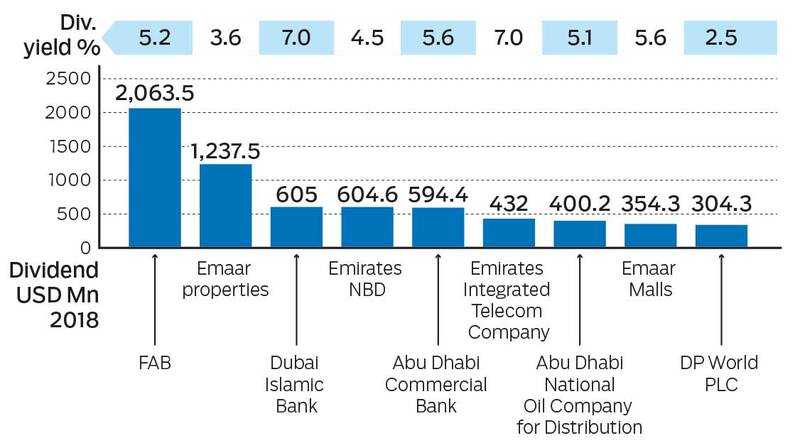 In case of some real estate names in Dubai, market is sceptical on the dividend paying ability of these names in the medium term. “We have seen stocks being punished significantly recently if the dividends are below expectations. In case of some real estate names in Dubai, market is sceptical on the dividend paying ability of these names in the medium term and that is reflecting in the high yields that these stocks are currently offering,” Nishit Lakhotia, Head of research at SICO Bank in Bahrain said. Dividend payout at Emaar Malls remained more or less steady at Dh354.4 million in 2018. Shiv Prakash, senior analyst with First Abu Dhabi Bank Securities has a bearish view on Damac Properties. They had recommended a sell at Dh1.41 and the trend still remains bearish and the stock may hit Dh1.26 in the near term. DXB Entertainment is giving a good ranged trading opportunity as the stock bounces from the support level of Dh0.24 finds selling pressure at Dh0.26. It would give traders good opportunity to trade in and out with a gain of 8 per cent per swing.